Hello, I'm a retired mathematics and computer science teacher. I played Morrowind to a stand still, and burnt out one Xbox on it. The second Xbox was saved only by the arrival of Oblivion and the requisite Xbox 360. Kalevala - (from the wikipedia) - an epic poem which the Finn, Elias Lonnrot, compiled from Finnish and Karelian folklore in the 19th century. It is written in the same meter as "Hiawatha" by Longfellow, and goes on 22,795 verses. It reads like an RPG game might, if it were recorded in verse. I started using the name back when Wizardry: Proving Grounds of the Mad Overlord, first came out in 1982. It has been a lucky name. I am extremely appreciative of all the hard work by the many contributors. A special thank you to my inspiration to contribute, Nephele. 73 This UESPWikian is 73 years, 11 months, and 29 days old. This user has been on UESPWiki for 12 years, 1 month, and 9 days. This user has made a grand total of 823 edits in 4423 days. This user plays Skyrim on the PC. This user played Oblivion on the Xbox360. This user played Oblivion on the PC. This user played Shivering Isles on the PC. This user played Morrowind on the original Xbox. This user played Morrowind on the PC. This user played Arena on the PC. No little badges but this user has also played Baldur's Gate II (Forgotten Realms, Shadows of Amn, Throne of Baal), World of Warcraft (lvl 80), Neverwinter Nights, the Ultima series, the Wizardry series, and the paper and pencil Dungeon & Dragons. This user rather likes RPG's. Which game does this user like best? The answer is always the same - the one he is playing now. No matter how bad a character created, no matter how poorly played up to now, no matter how high a difficulty setting, no matter what level, it is always possible to save the situation by running alchemy up to 75 through fast travel to towns, buying ingredients and selling potions. Save your money. Repeatedly cast Starlight (available from Edgar Vautrine, I.C.) using your Restore Magicka potions to get Illusion up to 50. Buy a 25% chameleon and an invisibility spell from Ita Rienus in Bravil. 1. If you have not been kicked out of the Mages Guild for the third time, then use Chameleon and Invisibility potions and spells to complete the recommendations. Buy lots of filled Common soul gems. Go to the Arcane University and enchant apparel up to 100% Chameleon. 2. If you have been kicked out for the third time, then use Chameleon and Invisibility potions and spells to get to level 10 by destroying Oblivion Gates. Save before you take each Sigil Stone. Reload the game if you don't get a Chameleon stone. Twenty reloads is average. At level 10 do Meridia's Daedric quest for the Ring of the Khajiit (35% chameleon). As soon as you can, you should use the stones to enchant apparel up to 100%. Either way or combination of ways, with 100% chameleon you conquer Cyrodiil. Like fantasy football, fantasy quests are not "real" quests. They are self imposed tasks that adhere to a set of rules. If you have a favorite fantasy Skyrim quest, I'd love to hear about it. EXAMPLE: This is derived from Hearthfire. 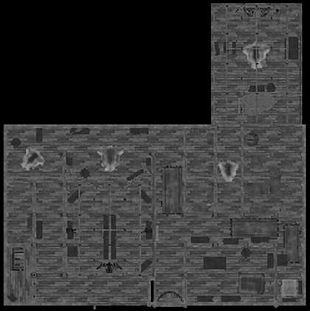 The quest is to build an armory for your army that will eventually conquer Skyrim. In each of the three basements of Hearthfire homes it is possible to build 10 safes, for a total of 30 safes. In each safe you must store stacks of identical items in single stacks of exactly 25. You may make, buy or loot the items. Nothing else may be in the safe. Since there are 30 safes, you may make an army of up to 750. None of their equipment is tempered nor is it enchanted. Yours may be, but all 25 must stack. In addition, each 25 man unit must differ from the others in some way. For example, one unit could have silver rings and silver necklaces, another might have gold rings and gold necklaces, another might have water-breathing enchantments on their helms. In short, the differences allow each unit to claim its particular dead bodies. When one unit loses more than 50 percent of its men it is defeated and flees the field. When one army of many units loses more that 50 percent of its men the army flees the field and the battle is over. The winner loots the bodies of all the dead from both sides. You need one unit of 25 to attack one of the seven towns like: Riverwood, Rorikstead, Dragon Bridge, etc. You need five units of 25 to attack one of the four minor cities like: Dawnguard, Falkreath, etc. You need ten units of 25 to attack the five major cities like: Whiterun, Markarth, etc. You need thirty units of 25 for the final battle to defeat the Empire and become high King. You need to take 6 towns, 3 minor cities, and 4 major cities before the final battle. Information on how to conduct the battles will appear on my sandbox pages. Although there are some on this wiki who seem oblivious, there is a difference between a map and a photo recon shot. Maps abstract important features and ignore ones unimportant to the purpose of the map. Thus there are road maps, airline route maps, floor plans, political maps, topographic maps, etc. They may be drawn from recon shots, but their usefulness derives from removing the burden of photo interpretation on the user. In this same vein of what some seem to obsess upon, let us look at "redundancy". MapQuest, Google Maps, etc. not only offer a written description (directions) but also mark the trip on a road map. Users vary in their preference for directions vs map vs both. There is more than one modality for viewing the world and learning about it. Yet in the name of "redundancy" some seem only too eager to remove maps and force the visitor to wade through the text. A picture is worth a thousand words is just redundancy to them. Let me add some specificity to this rant. 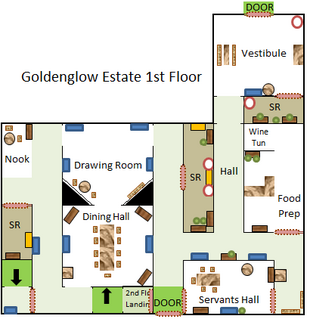 Consider the following orthogonal photo shot of the main floor of the Goldenglow Estate. The plane of projection is above the rafter ties. Door ways are obscured by their header beams. With those hints, and using only the photo, draw in the room boundaries and doors. Does your drawing look like the one below? If you are a "map" person which do you find more quickly informs, a. the article, b. the photo projection, or c. the floor plan? Can you think of good reasons other than "consistency" and "redundancy" why the user should not have the information in a quickly usable format? I share Emerson's opinion that foolish consistency is the hobgoblin of little minds. Furthermore, a map and a description are not redundant to a fault given the different learning styles of visitors. Conclusion: It seems to me the sane policy with the visitor in mind is to provide both map and description, and where the .dds file's photo projection is not clear, allow hand drawn abstractions along side that photo projection. Resolution: SarthesArai clarified the actual policy and practice, to wit, 1. maps should be and are being provided for all locations, 2. modifications for clarity are allowed and the resolution should be increased on the stored .jpg to allow the user a magnified view, both of which mitigate the short comings of the .dds version, and make a separate or hand drawn map unnecessary, 3. maps should be rectified to have north at the top using the NorthMarker in the cell, and 4. the map should be cropped.